No theme, just some observations and thoughts. Played V:TES in Pleasanton recently. One game, about four hours, 20 minutes. At the four mark, I was winning, even though my grandprey in the five-player had self-ousted right after rescuing one of my prey’s vampires (they were all in torpor). It was an interesting game. At times, some players didn’t have much to do, but everyone was highly involved some of the time. It took me a few tries, but I nuked Jost with Anathema + Archon rush. I was amused by my deck as I brought out Greger, gave him Potence, got blocked bleeding, so Disguised out a Deer Rifle! If not for the Deer Rifle, I would have been toast as my predator had Basilia, who got both the Blade of Enoch and a Weighted Walking Stick, and my prey was Celerity/Protean aggpoke. When my prey did get Desert Eagles, my guys started exploding. I did end up using a couple of the Grenades I Concealed out as well as tried to punch a few times for five with Torn Signpost + Undead Strength. Speaking of too many weapons, my grandpredator was playing a Pier 13, Ghoul Retainer deck. Of my four Sabbat Threats, three were blocked and the other did a mighty one pool damage. I am constantly amazed by groups that have had various campaigns that don’t make a concerted effort for party PC design. I don’t mean the sort of “force you to storytell” mechanics of a game like FATE but just making sure that the party will have a reason to adventure together. Nor do I mean mechanically fitting in a party, since GMs can adjust to party strengths and weaknesses. Wargames, like D&D, might require that you have party balance to play “normal” adventures, but most RPGs handle unbalanced parties. I mean in character reasons that my character would adventure with other characters I don’t like or have no respect for. Same issue when introducing a new character to an existing party. I’ve already designed a new character for one of my campaigns because I have yet to see how my current character would work with one of the other players. Yes, I mean player, not PC. His PC is an extension of his interests, like my character is the extension of mine. The two PCs are polar opposites. As I have an extremely collaborative personality and prioritize the plot and the party over individual goals/interests, it makes sense for me to create a better fit. This was actually something I worried about as soon as I saw the other players’ concepts. Now, I haven’t decided to switch characters yet as the campaign hasn’t progressed that far, but unless I see some real change in the party dynamic, I should pull the trigger soon. I have frequently praised L5R. I have noticed something, however, that is a weakness of the roll and keep system. I quite enjoy the openended rolls possible when faced with a static target number. I kind of ignore that the Raise system doesn’t work like it’s presented. I have decided that I’m not much of a fan of contested/opposed rolls, however. The random “I rolled 50 on 3k2” is cool when it, 1., is better than rolling 25 and, 2., isn’t rolled against another PC to determine who wins something. I’m not even that thrilled when a NPC rolls some crazy number to beat a superior dice pool of a PC, but it’s especially unpleasant when two PCs are contending (in a contest, say) and the inferior competitor so often defeats the superior. I’m fairly bored with most of Scepter of Zavandor at this point. The parts I’m not bored with are the endgame manipulation of VPs and certain subtleties of play. Not that these mean much when I play a better game than the people I typically play this with. While others pointlessly pick up Crystal Balls, I get Crystals of Protection and far outproduce. I’m the only one who ever seems to get the Tomcat Sentinel and convert my gems into Opals. I’m happy to believe that there are better players than I, but I don’t need to be clever in how I buy Sentinels, be clever in when to buy inactive gems, or need to figure out how to ever get any use out of Crystal Ball. I could report on our Seafarers of Catan game, which nobody seemed to enjoy, and our Dominion games, but I don’t like either game. I at least like Scepter, even if I’ve grown tired of it. It’s normal for me to tire of boardgames since they are so limited, so no big deal. I still consider Puerto Rico the best Euroboardgame I’ve played and I grew tired of that years ago. I did comment to someone in the group that I should look around for a new boardgame. I finally got my copy of the latest book for 4th Edition Legend of the Five Rings. My review of the previous book can be found here. Unlike last time, I have read a substantial review of this product on a gaming site already. David Giles wrote one for rpg.net there. So, some of my remarks may be in response to things he wrote. I’ll just go quickly through some areas I mentioned with the previous review. Typical of the line. David brings up that the art is from the CCG. While I think the art in these books is decent to great, I do feel like certain images are overused and there is art that I’d like to see more of – cleaner images of people interacting with the world mostly. There’s an introduction that speaks of how to use each chapter. Some may want to focus on canonical stories, others may want nothing to do with knowing what’s going to happen, while some may want a different spin on the familiar. Different eras may suit different desires better. And, so forth. Each era gets an explanation for how it can be used. Then, you get a chronology with notes. The status of clans and other factions, such as Shadowlands, is detailed for each era … one can easily forget that the Unicorn are absent for almost all of the first nine centuries of Rokugan … for reasons that I will get into. There is some discussion of theme for the era. Important characters. And, a few mechanics that may or may not be relevant only to the particular era. I quickly grew tired of reading it. While arguably not the same as the chapter heading fiction, I did read some of the sidebars with Ikoma’s comments about The Dawn of the Empire era. I just didn’t feel like Ikoma was saying them as they lacked a worldliness to them. The meat of each chapter is what challenges are going on during the era. These are all done well enough, I suppose – I haven’t really thought about how I would use the information to run a campaign. That I’m not really looking at the material as someone eager to incorporate one of the eras into a new campaign is a bias that should be taken into account, of course. Clear effort was put into explaining what sort of campaigns the eras would be good for, and I have a lot of respect for that. Not every group wants a political campaign. Not every group wants a survival campaign. Etc. I do question, a bit, how four of the eras are all within a century of each other. David and I may have different views on specifics – he wished that Heroes of Rokugan did more with the Spider Clan, I wish the Spider Clan had never been conceived as it’s insipid, we seem to agree that L5R, the RPG, is overly tied to L5R, the CCG. Sure, 4e is the first version of the RPG to aim for timeline neutrality rather than setting in where the CCG currently is, but Imperial Histories reminds us of how influential the CCG is by having era after era that starts with the era when the CCG was originally set and continues forward from that point. There is certainly value in providing info on such eras for someone like myself who doesn’t follow the CCG at all. The current HoR campaign, in fact, picks up right after one era and draws upon the following era, so I get to learn more about important NPCs, the background, and possible, related events. It’s just that one might expect more on eras that we know little to nothing about. Heroes of Rokugan II gets a chapter. I, of course, know all about it. David thought it was more what the product should have been about. He is far more concerned than I am with the repercussions of events in Rokugan, with evolution. Everyone seems to agree that The Great Famine chapter is awesome. A contest was held to have someone contribute an era to the book and Jason Bianchi’s entry won. For a game largely driven by its CCG, this sort of supplemental material only for the RPG that does no harm to the CCG is perfect. Well, maybe not perfect. David’s complaint is that in order to not mess around with future history everything needs to be swept under the carpet, expunged from “official” history and forgotten by later generations. That it makes one feel like nothing you do during that time matters. Though, as I would never have a campaign where the future is already written, I don’t see the issue with having a campaign in the 7th Century and diverging at that point in history. My greater concern with the eras set before the 12th century is that so many elements of L5R I’m familiar with don’t exist. Numerous minor clans won’t exist. Schools won’t exist. In The Dawn of the Empire, obviously, a lot of the schools won’t exist. Families won’t exist. The Unicorn aren’t even present for three of the eras and partially present for one. HoR2, with its “take everything you know, assume that not much has changed except that we aren’t doing the same events as the CCG anymore” tactic is the most comfortable to me. For instance, I am playing in a home campaign, now. I don’t know that I mentioned this previously. Our home campaign is set in 1001. No Monkey Clan. No Jade Champion (was vacated hundreds of years earlier and reinstated a century later). It’s not superweird – the Unicorn are back, for one thing. But, it’s different enough to notice. It does have the advantage, of course, of ignoring the Spider Clan, the Destroyer War, Iweko Dynasty, even The Four Winds era, none of which I’m all that enthralled by. The other notable alternate timeline to HoR2 is KYD – The Thousand Years of Darkness, an era mentioned before and highly desired by some. It provides an example of how to make a real mess of Rokugan. Other chapters talk about how you could diverge immensely from canon. This chapter is that divergence. HoR2 ends up being a major divergence in what crazy stuff didn’t happen rather than what crazy stuff did happen, but it also predated a lot of the weirdness the CCG inflicted upon canon. Imperial Histories 2 is a product that already sounds in the works for release maybe two years from now. A number of people have commented about what they would want to see. Some want to go animesque, sci-fi, modern, whatever. After all, there’s only so many variations on The Great Famine, “fill in the gaps with secret history” style era. And, yet, the Devil is in the details. We all likely want our version of L5R, but it takes effort to come up with your own campaign ideas, so if someone is willing to go to the trouble of detailing the ideas, makes life so much easier, as we see by people using HoR2 for their own campaigns. There aren’t a lot of new mechanics. That’s not so unusual, as Emerald Empire didn’t have much, either. Even more so than EE, though, I’m just not that interested in what game mechanics are included. Some are time specific. Most are far too narrow in scope. The one thing most relevant to me – Tattooed Monk mechanics – weren’t even all that. First, they are schools rather than paths or advanced schools, so I doubt the campaign staff for HoR3 would make any use of them. Second, even if they were somehow relevant, the mechanics go in the opposite direction I want to go in. While it’s claimed that Hoshi Tsurui Zumi care less about combat, the school still forces unarmed combat mechanics down your throat. Why can’t there be a Tattooed Monk School where you get to choose not to be a martial artist archetype? I am of the belief that one buys every product put out until it becomes clear that the quality/effort drops. It’s a trivial amount of money to keep up with about four products a year as expenses go. x Don’t bother if free. ** Look for if you must or buy at deep discount. **** Should have in collection if you play the game/genre. ***** Should have in collection if you don’t play the game/genre. While kind of a strange way to measure things, since it will lump this book in with books I think are better, it rates ****. My system is showing its fundamental flaw, as Imperial Histories would still get **** due to being a worthwhile reference, but I would say it’s more like Emerald Empire and less like the more important The Great Clans. I’d even put it behind Emerald Empire due to the mechanics being mostly meaningless and the ideas being more for an aspiring GM, rather than a player or someone already running a campaign. x Waste of space, sell or toss if owned. * A bad product that might have one thing you want. ** Mediocre to average product. Usually limitedly useful. *** Good product. Gets looked at *or* key to specific campaign. **** Superior product. Regularly referenced. ***** Product that’s so good that you want to use it for other games. So, this fits better as a ** or ***. I might decide that it’s a good reference and gives me ideas for characters, campaigns, or whatever. For the moment, it’s an interesting read that I think is necessary up to a point for consolidating various canonical storyline information but not a product I’ll need to look at all that often. I don’t even look at Emerald Empire that often, which suggests to me that EE should be a ***. Because of more important mechanics, I do look at The Great Clans often enough, but it’s also probably a ***. Enemies of the Empire, for enlightening me to a great deal I didn’t know and for giving ideas for antagonists, would be more like a ****. I mean, I do love the aesthetics of all of the new books. They are so much more pleasant to read than other RPG books with a lot of evocative art. And, if you play the game regularly, there’s no reason not to have the books, but some are just better than others. And, I do think having more relevant mechanics is something AEG can work on. I don’t like movies. In a general sense. I just don’t like movies. I’d much rather read a book or watch TV. I’m not all that into special/visual effects. Even better movies are typically too short and unsatisfying. So, why did I see John Carter when I hadn’t been in a movie theater in years? I particularly think it’s a bad idea to see a movie when you are familiar with the source material, especially if that source material is a book (including comic books). I’ve read the I Am Legend novella. I didn’t like it. I wouldn’t recommend it, though I’m not a fan of true horror, so maybe it’s more appealing to people who like horror. But, it had a very specific point to it – the ending. A point utterly failed by Will Smith’s movie. Use the same names and a similar situation … and tell a different story – that’s what movie adaptions typically do. The adaption might be far better, but I don’t recall any instance when knowing about the original going into the movie made the movie seem so, rather it just struck me as different. There are James Bond novels I’ve read after the movies, and I enjoyed the movies more, hardly remembering the particulars of the books. Can I think of an instance where I was happy to read a novel after being introduced to a story through a movie? Not off the top of my head. So, it may just be that I identify a story as something unique. One can see this in comic books as well, where I rarely had interest in reimaginings of characters I knew, even though comic books do that all of the time. Note also, this is why I don’t watch superhero movies, even ones that get good reviews, like Iron Man, though I never cared that much about Iron Man, so maybe I could break down and watch that some day. Obviously, I’ve read the John Carter stories. I think of them as an eleven book series, but originally, they were magazine stories as most science fiction, fantasy, and/or adventures stories from back in the day seem to have been. I’ve read them multiple times. I like them. In fact, given how much other series I’ve read deteriorated to the point where they are embarrassingly bad (Laurell K. Hamilton’s stuff, Wheel of Time, Elric stories), my respect for series that didn’t fall apart had been growing. I suppose it helps to just stop at some point and no longer continue a series just for monetary reasons. That book 11 suddenly ends without a resolution to JC’s predicament is unfortunate. While I never expected to enjoy the John Carter movie because of my experiences with not enjoying movies based on books I’ve previously read, I did feel compelled to check it out because it felt important. I was amazed that someone had finally tried making a movie after only a hundred years. The box office has been far worse than the reviews. The reviews have been mediocre. The reviewers have pointed out the numerous difficulties of selling an audience on the property, given how much later properties have drawn upon the (more) original and have already claimed the minds of those unfamiliar with the older stories. Though, reviewers often give passes to movies they shouldn’t have, such as Star Wars Epidodes 1, 2, and 3, which I find to be abominations. Maybe, if they weren’t Star Wars movies, they would be adequate movies, appealing to those who care about special effects. But, they are just offensive in how boring they are, how unappealing the characters are, and how obsessed they seem with special effects over an enjoyable story. The twin contexts of, one, having the books to compare to and, two, not generally liking the medium of movies left me quite unimpressed with John Carter. Much like Natalie Portman was the only thing of interest to me in the more recently made Star Wars movies, Lynn Collins was the primary thing that held my interest, calling to mind someone I used to work with. And, for those who have read of Dejah Thoris, perhaps read the comic book stories I’ve never read, it can be amusing to contrast the damsel in distress of the novels with the warrior/scientist of the movie. Conan, Spellsinger, Gor. Versus. Thomas Covenant, Wheel of Time, any Eternal Champion. I don’t expect people to have read the same series I have – I certainly haven’t read many series others have and don’t remember all that well some series I have read, such as Lord of the Rings. So, the difference between the first group and the second group needs some explanation. One could say the second group is either high fantasy or prone to high fantasy, but that isn’t the point. The point is that the first group has worlds that make for good places to set a role-playing game where the latter group has worlds where that’s a problem. What problem? The problem that the world is far too dependent upon a singular character or small group of specific characters. Conan may be the most badass dude in his world, but he isn’t necessary to it. Whereas, no Eternal Champion story functions without an Eternal Champion or three. It’s unfortunate in that Thomas Covenant’s fantasy world and Wheel of Time’s world are both well suited to having RPG characters – those characters just wouldn’t be the characters who are of prime importance (outside of playing an established character). It’s certainly possible to play some bit character in the grand scheme of things; I just find it offputting to know that no matter what my character will ever do, it won’t be relevant in the way that the book characters are relevant. John Carter may be the Jesus of his world, but he’s not necessary, unless you give a crap about every race uniting, which I just see as a side plot to the constant attempts to recover kidnapped women. So, Barsoom fits well into the group of worlds where the characters can carve out their own destiny. JC and Conan are much alike in how they both rise to a level of great prominence but are easily replaced. When I reread the whole series, I’ll know, but my recollection is that about five of the eleven books in the John Carter series aren’t about John Carter at all. While reasons have been given for why a movie took a hundred years to make, needing the special effects technology to catch up mostly, it has been amazing that so little had been done with a RPG. I was in a local game store a few months ago and stunned by how a RPG completely ripped off the Mars books. Why not just get the license for the real thing? Probably because estates are weird and reluctant to do such, even if it’s unlikely to be screwed up. I don’t hold out much hope that a new official RPG will be made. There was the 1978 miniatures game John Carter, Warlord of Mars and there is the newer game, whose name escapes me and which I cannot find with an online search, that is a complete ripoff. I’ll just have to check the store again. Still, you don’t need an official RPG to set a game in a world. I believe JC was written up as a 30th level fighter in AD&D terms. Can scale however you want, but given unaging warriors who fight for the thrill of fighting to the death their entire lives, a mediocre swordsman on Barsoom could be 10th level, with 20th level fighters being rather commonplace. I hadn’t thought much of what system would work well. I don’t find that level systems model source material all that well, unless you freely start characters at mid/high levels or have them jump in level rather easily. A percentile system could possibly capture the difference between the 90%/90% attack/parry “common fighting man” and the 99%/99% or 180%/180% or whatever elite fighting man of Mars. I have a hard time envisioning L5R working, what with there being far too much variance in results and far too many rank 8, 9, 10 Swords skill characters. I wonder if Savage Worlds might scale correctly with numerous d12+1 vs. d12+3 fights, though, again, variance. The whole point of sword fights on Barsoom is that you are either clearly better and cut down a dozen warriors easily or face a highly skilled swordsman and have to open a dozen minor wounds before polishing someone off with a desperate/rage-induced/lucky final strike. Actually, 3e L5R dueling rules might capture the nature of important one on one fights. Speaking of one on one fights, another huge problem that RPGs have modeling. Interestingly, Conan has a supplement that has rules for an epic duel. But, in general, the mechanics just don’t lend themselves to duels. I suppose I could play with it a bit to see if normal L5R can model general combat where my Agility 7 Earthling with Swords 10 just rips apart a dozen Agility 4, Swords 5 nobodies, while the Iaijutsu rules get used for one on one fights. Though, a huge problem with one on one fights has nothing to do with mechanics and everything to do with the difference between a single protagonist in a book and a party in a RPG. Well, okay, that and the rather important bit that book characters don’t die (unless they can be resurrected), that they are irreplaceable to the story where RPG characters are rather less interesting when they must win fights for the story to make any sense. Given the nature of Barsoom, one could try to find players into modeling duels, one could abstract action to some degree to avoid having a single player fighting a long, drawn out duel while others aren’t involved, or one could just choose to find a more party friendly world. Given that few people I know have read the books and, therefore, have no particular allegiance to Barsoom, probably just not bother coming up with something, just as I don’t bother with most of my RPG ideas. Another instant classic, this time from a post to the Alderac L5R forum. I started responding on the thread about Mirumoto Bushi when I realized I would have just been threadjacking, so here goes my concern. 1. Inversion of wound chart, making even low Earth characters unlikely to be in wound penalties. 2. Lower attack bonuses (Free Raises, static) combined with higher base ATNs making it harder to hit, not only reducing damage which the lower Earth characters enjoy but also leading to high Reflexes making hitting much, much harder than in 3e (3e being when missing was never expected). 3. Less reason to buy up skills, leading to more points devoted to traits with the best bang for the buck with skill use being Awareness. Increased Void cost of 4e can siphon off points, but that still doesn’t encourage Earth above 3, Water, or even Fire (as important as Agility generally is, see 4. for more on Reflexes) for bushi and courtiers. 4. Far more tactical movement use, leading to combats that start further away, leading to more ranged combat. 5. Three key Awareness skills, generating increased value out of Awareness increases. 6. Agility no longer mattering for dueling. All of this can be undermined, of course. Magic and special attacks are a great way to ignore ATN and make Willpower more relevant. Successful Fear is incredibly harsh. Cover or restricted combat setups and forcing characters to string bows (which I wouldn’t as it’s just annoying and shafts Tsuruchi, et al) would reduce the value of bows. Making Investigation, Hunting, Intelligence skills more essential to success reduces focus on Awareness skills. But, still, given that the Awareness skills can’t just be ignored and Reflexes didn’t lose anything from 3e to 4e, while my sense is that Earth did and Agility has a harder time keeping up with Reflexes while losing dueling relevance, I’m weary of how important I see the Air Ring being. Only likely to be exacerbated when The Book of Air comes out. While I probably disdain the Water Ring the most, I’m fond of Perception. I just find the Air Ring a bore and try to ignore it when my characters aren’t forced into it. This is quite detrimental, of course. Putting aside how important Awareness is for dealing with people, by ignoring Reflexes, I’m hurting initiative, which was essential in 3e, the game of whoever strikes first wins, and Armor TN, essential in 4e, the game of grinding away where someone might actually miss with an attack. I had a 3e character who sucked, hard, relative to the 3e standard. But, I enjoyed him for his unkillability. He could hit people, especially with Full Attack stance, which he could survive due to Earth 4. I have a somewhat similar build with 4e and it’s obnoxious how dependent he is upon armor (for not getting hit and reducing damage). Sure, I see all 4e bushi being largely screwed when not allowed to use armor, but at least a Reflexes character can dodge attack after attack and still isn’t that likely to be in wound penalties if someone rolls unusually well. At least initiative is not as important as it used to be, though that does depend upon not facing a bunch of spellcasters who can make a mess of combat before you act. On the flip side, those spellcasters do ignore ATN, so at least Reflexes doesn’t help as much defensively. Maybe, it’s just that I play in less investigative adventures and more social + combat adventures where Intelligence and Perception become less relevant. One would think Card of the Weak posts would be easy. Pick a card, talk about it. After all, when I build decks, I frequently pick a card and then think about all of the different things I can do with the card. The card can’t be generally considered to be good. The card has to have interesting features. Eyes of the Dead may be weak, and you might come up with some convoluted idea for why to put it in a deck, e.g. it stacks with The Deadliest Sin for your Faithful Servant deck or crosstable stop diablerie deck, but I want something I can drone on and on about. I have to be interested in droning on … em … talking about the card. I justify #1 with Ghoul Retainer only having appeared in six tournament winning decks: three Tariq decks; Tsunda No Secrets; weenie Auspex; Una. As for #2 and #3, well, I did choose this for only the second entry in this “series”. Description: Burn opposing vampires with environmental Bombs and aggpoke. This deck is so awful it’s, well, awful. Not as awful as other decks. More awful than many. 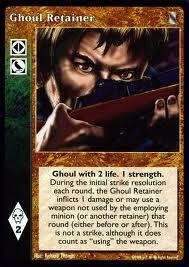 As an example, it’s kind of interesting in that it wasn’t Ghoul Retainer that was the reason for the deck. The impetus for building the deck was trying to find a reason to play with Stutter-Step. May wonder why that’s so hard. Another possible Card of the Weak entry. Way back in the long, long ago, before Bats and Crows came to rule the magic land of The Kingdom of Kombat, there were decks that played a card known as Immortal Grapple. Immortal Grapple, by unnecessary rule, stopped Stutter-Step. But, but. Stutter-Step is so aggpokey or Torn Signposty and acts as defense when IG isn’t played. Well, yes, it is just that amazing, amazing enough to show up in eight decks in the TWDA. The greater issue is how many close substitutes we get, nevermind that the Torn Signposty deck may like playing IG itself. Sideslip for defense against pokeyness. Additional strikes that came with maneuver, press, dodge, another additional strike. I seem to have gotten completely off track in talking about Ghoul Retainer. So, there I was, less than an hour ago or so, looking at retainers. I started looking at vampires with retainer cost reduction. I did a search for Jibade decks. I found one. And, it was a Ghoul Retainer deck. There are many, many cards in CCGs that are “only good in play” cards. What does that mean? It means that the card seems perfectly respectable, perhaps even strong, when someone has gotten it into play, but the card is actually quite bad because the likelihood of seeing it in play (or seeing it in play without the player getting ousted because of it) is so low. Cards in this camp tend to be ones with high costs. If the high cost doesn’t cripple you or the game goes long past the point you played the card or whatever, you’re gold. Ghoul Retainer has a high cost, a very high cost. Would the card be too good at 1 pool? Can’t see how. Why the card even costs pool is less than clear. At 2 blood, would it be costed better? Probably. It is interesting that a pool cost on a retainer means that an ally can employ it. Then, there are the other costs. The action to get a retainer may not be all that great a cost, otherwise people would never bother with retainers at all outside of plays like Pack Alpha. Still, 2 pool and an action. Then, what does the card really do for you? Somewhat better in combat by itself, only shining when you have weapons to hand off to it. Weapons tend to cost more pool, making the combo quite expensive, though each of the cards, at least, is probably playable on its own, so it isn’t combo-dependent. However, we are still talking about a combat support play. There’s a reason I play J.S. and Tasha a lot and combat support plays not so much. Yet, the point is to find uses. I see a decent amount of deck design space with Ghoul Retainer in mind. While I have little interest in Tariq decks or Una decks, we can see a couple of other uses that people have gone with. In some cases, I see Ghoul Retainer being tech. Environmental damage, especially environmental aggro, may be very hard to deal with, though given the prevalence of Carrion Crows these days, one assumes a certain level of metagaming against environmental damage. Outside the Hourglass annoyance would be another reason. Note that Ghoul Retainers can be smited. In fact, Aid from Bats, Aid from Bats is a real threat for removing the overcosted retainer. This is why we meta against Animalism or wish we could meta against Animalism with DIs and Botched Moves and not having room for such. Is anything about this deck reliable? Not so much. I chose not to be a slave to my theme by ensuring the Ghoul Retainer beatdown. Nor did I run a bunch of other random retainers or, since they both discount on allies as well, a bunch of random allies for support as the deck would get too far afield from its plan. I could cut good stuff to make room for theme, but there is always the idea of trying to build a serious deck, if not a powerful one. Direct Intervention to mess with Carrion Crows … the idea that the game has gone to the point where this would be the primary reason to run DI is amusing I suppose … and other plays would require some annoying cut. I’d rather the deck were 75 cards, but then, I might be getting too focused. Though, switching fatties with disciplines for smaller minions could see freeing up slots used on discipline-requiring cards, while also likely killing my defensive abilities. This is derivative of the deck I found while searching for Jibade decks. Certainly, there are plenty of other possibilities with Ghoul Retainers, if not trying to recreate Stuttering Bangs. A range control deck could easily see Gas-Powered Chainsaw for close range beatings without a big cost. Improvised Flamethrower is a favorite as environmental agg is kind of a pain to deal with and burning vampires becomes so much easier. Ivory Bow, by itself, becomes much more of a threat with Ghoul Retainer. Decks with substantial pool gain or defenses can ignore trying to use cost reducing plays like the vampires I went with. I went with my vampires dodging, but a perfectly reasonable way to go is with agghandsors with the Ghoul Retainer acting much like Carrion Crows. Now, Carrion Crows is so much better, but Ghoul Retainer can be a smaller card slot investment and can support all of those useless vampires that lack ANI. Brandon and I drive up, get to Berkeley before 10AM, find a good parking place, and are left wondering what to do about food. We wander around a bit and settle on a breakfast/lunch coffee/tea place. Run into Ian and his friend while eating, then head over to Games of Berkeley. I repeatedly made the comment about how I was amazed that more people weren’t familiar with Games of Berkeley’s basement. We used to run Babylon 5 tournaments down there over a decade ago. A lot about the store was the same, but the downstairs was a lot better. It was better lit, there were more gaming areas, so it felt less like a dungeon with many employee only exits, it might have smelled better than back in the day. Still little air flow, so it got warm and stuffy. Anyway, folks tried to contact everyone under the Sun to get to a tenth player since, as everyone knows, the only prize that actually matters in V:TES tournaments is the TWDA. Didn’t work. I blame East Bay people. I used to care more about this sort of thing. Another sign of how much less gravitas I put on the game is that it didn’t really bother me. This was horrid seating for me, knowing very well that Alex’s not new deck was just going to be an endless succession of combat cards supported by easily being able to block my actions. Meanwhile, if Kenneth went forward with Shamblers, the two combat cards in my deck weren’t going to stop me from being minionless. What was funny was that my Pushing the Limit was in my opening hand. Combined with no one yet having seen the deck, it was unclear what the deck did. I Info Highway first turn, put 5 on Ezmerelda. Turn two, Rake. I couldn’t really decide who I wanted out first. Rake was the best disguise but less useful than either Gilbert Duane who was the only crypt option for my primary discipline – Obfuscate – or Ezmerelda who could be Villeined early. Alex and I had virtually no interaction in the game. I didn’t want to take easily blocked actions, so usually acted only when Gilbert could stealth me. What little bleeding I did was bounced. My votes kept getting discarded, though I did Banish Le Dinh Tho. His first two discards were On the Qui Vive and Pushing the Limit. Eric didn’t have a whole lot of impact in the game, getting largely beaten up by Alex and losing a Famous Ayo Igoli to Breath of the Dragon, which made no sense to me. If I had to say why I’ve had more success than a lot of other locals, it would mostly be due to my interest in playing until the game is over. Another sign of fewer gravitasons in my sphere of influence is that I really stopped caring about this game. Kenneth Famed me and rather than tap Dreams before entering combat with a Shambler, I let the Shambler come for Gilbert and drop him. Not that it really mattered. The game was inevitably between Alex and Kenneth and it was all a matter of how the combats went between them. Ian T. (Armin Brenner Coalition) -> Lev (Barrenness) -> Alex O. (Nahum PRE anarch) -> Ian L.
Much chagrin by Ian T. over Lev’s deck as Barrenness shuts down his deck’s babymaking and nukes the weenies. Funny thing was that Scourge of the Enochians came down early and it only ever blew up one of Ian’s dorks. More screwed was Alex. He tried Pentex Subversion on The unnamed, but I burned it as it was way too early. The unnamed quickly got Enkil Cog and double bled a lot, which Alex had limited defense against, relying more on Scobax for bleed reduction than Auspex for good bleed defense. Armin did Banish The unnamed, which helped a little. Some of my cool plays got killed with Evil Eye. But, I essentially had no predator, so I amassed Princes and blew up Ezmerelda a few times. I played a fairly early First Tradition, which mostly hurt Alex, but it still seemed okay. I later dropped multiple First Traditions to lock Ian and Lev out of the game and had enough offense to finish Lev off, though it was disturbingly close. The five player timed out as the first round five player timed out. Ian T. and Kenneth were fourth and fifth. Brandon chose to sit downstream of Kenneth. I didn’t want anything to do with either Kenneth or Brandon, but I’d rather be upstream of Kenneth and didn’t fear being downstream of Ian, so I inserted between Ian and Kenneth. Alex liked how impotent my deck was offensively and wanted to be away from Brandon and sat between Kenneth and me, though I would have also considered being between the two Ians as he would have been away from both other combat decks and didn’t really have anything to fear from either of us. My first two turns I discard Fear of Mekhet. Therefore, I cannot lose if you define losing as not discarding two Fear of Mekhet on one’s first two turns. Ian T. did not have a good game. His first vampire was a !Gangrel with inferior Presence, so no superior Enchant Kindred, no Unexpected Coalition, only one vote. All of my vampires have 2 votes. I brought out Volker on turn 2 and Greger on turn 4, not having any acceleration to bring out Ezmerelda for a few turns after. While the best of the games, if not the best for me, there still wasn’t a whole lot going on. Brandon couldn’t care less about Shamblers, which he could nuke at will. Ian had little to do that mattered as I didn’t feel much threatened. Alex had the most meaningful interaction for much of the game. Alex managed to get low on pool as most of his masters got Washed away by Kenneth and me. I was doing okay with Papillon to restore my guys who got emptied, such as Ezmerelda who got hit for nine in one combat by Velya and Rotschrecked another time. I untapped with an empty Ezmerelda and considered whether to pop her or whether to lunge. I figured lunging made more sense since there was so little chance of my deck getting through Alex’s normally. I fail. I fail a couple of other times as well, having bleeds of three from Greger, his Camera Phone, and his Old Friends getting bounced. Meanwhile, Brandon takes out Ian with Fame and bleeds, which tends to happen when you have no predator. I suppose I should mention that I couldn’t pass votes much of the time as I allowed Ian to get Cardinal Benediction off and Alex had Meshenka and Velya, so Ian going out was interesting to me. Brandon going out would have been better, in theory, removing Narrow Minds from play and giving Kenneth the ability to do stuff forward. Instead, time limit drew near and Brandon finally destroyed my board and bled me out. Oh well. I do have a few things to say about my deck. First, I never played a KRC all day. The deck is probably offense shy, anyway, since I need to violate people while First Tradition is in play, but it’s no wonder that I felt like I couldn’t really hurt folks (ignoring the whole wall deck as prey two rounds thing). Second, I still don’t have a great idea how to use First Tradition in this deck. In two games, I didn’t even try putting it into play, fearing that it only helped others more than me. Yet, those two games were the two games I lost. And, the deck chokes horribly if it just discards them. Third, there was a third thing, but I forgot. I guess I could say that the crypt could be less silly as the Brujahs’ main value seemed to be in confusing people rather than causing pool loss. Lack of Parity Shifts? That was intentional. I considered at the last minute putting some into this deck I designed in June, but then, I remembered how boring Parity Shift is. Deck does need changing. If it doesn’t play First Tradition, it fails conceptually/strategically, and it’s not very good at playing First Tradition. Not that I’m much of a fan of First Tradition since the whole point of the card is to limit interaction – that may be good, but it’s antifun. 1. Spirit Realms besides Ningen-do detail, including areas between realms. What do Fortunes look like when you meet them? How would you survive for extended periods in Toshigoku or Gaki-do? And, so forth. 2. Military Campaigning – Imperial Legions, Jade Legion, Clan Legions – What are they like? How do they fit in with samurai serving locally or “adventurous” samurai? Can be more on mass combat for tabletop RPG play, though I’m expecting The Book of Water will address mass combat alternatives. 3. Adventuring in the outdoors – There’s a lot of uncivilized sections of Rokugan but too many details need to be worked out by a GM for anything more than “oh, look, a bandit camp” such as having animal encounters laid out in detail. Not to say it should all be about fauna, how to find water, extreme elements, and such that can be found with some research but also just what are the uncivilized areas of Rokugan like? What is it like to go into Shinomen Mori? What is it like to spend a week climbing mountains in Dragon Lands? What are islands without ports and cities like? 4. Monsterhunting campaigning – While monsters can easily show up in a book focused on Spirit Realms and it’s not really necessary to statblock everything under the Moon, I’m thinking more of a campaign that is monster-smiting focused, not to be confused with a pure Shadowlands supplement. In addition to more on the Shadowlands, what would a roving band of monster hunters really find within Rokugan? Perhaps may notice the trend: I get plenty of politics and intrigue already, I’m more interested in heroic adventuring and more physical adventuring throughout the world(s). When I think of what Asian fantasy role-playing that I want to do [censored], I think of an InuYasha style world. There are all sorts of spirits and many of them are naughty and the roving band of heroes tries to help innocent folks get by in the country – cities and large population centers are never, to my knowledge, shown. Now, InuYasha is a bit lacking in subtlety for me; I wouldn’t say it’s too high fantasy as I like high fantasy but more that the PC abilities tend towards the over the top stuff you see a lot in anime. In particular, InuYasha with his sword and Miroku both have abilities that are more superheroes in a fantasy world, which would be okay but not the more ghostbusters vision I have. But, this isn’t going to happen. Or, at least, it’s unlikely. It’s not that it would be all that hard to strip L5R of numerous mechanics and flavor elements logistically, the issue is that people have expectations based on the source material, including just the mechanics in the source material. In other words, as a GM (though I’d prefer to be a player) in such a campaign, the actual L5R RPG books would need to be hidden to not give players preconceived notions of how the world works. Roll and Keep core mechanic, Rings/Traits as per L5R, combat system, weapons, mundane goods, even magic system could all be retained, but it should be written out in a document stripped of all of the Rokuganiness of L5R. A different Asian FRPG system could be used much the same way. Qin: The Warring States, Weapons of the Gods, whatever – the need, though, is to separate out world specific elements that don’t fit this sort of campaign. Do people do this sort of thing all of the time? Sure. Fantasy Hero or any other generic system could be redone to reflect an Eastern world. Non-generic systems are repurposed all of the time, as well. It’s just that so much of L5R is wrapped up in its world as a niche product. Anyway, back to the realistic. I find 4e L5R supplements to be amazingly good. A step up from 3e and a huge step up from some of the 1e books that felt mechanics heavy even if they were supplying some essential world information. Now, having said this, I still need, as a GM not so much as a player, visuals and details that players largely don’t care about. I want to know what a small Mantis island looks like. Do they vary much? I want to know what the terrain is like in Gaki-do and what there is besides gaki. I want to know how the Imperial Legion functions since it rarely seems called upon to fight in times of peace and it’s a major disruption from the normal duties of samurai. Actually, I don’t even know what is normal for samurai. Emerald Empire will talk about birth, gempukku, death, marriage, but what about: What do samurai get assigned to do after gempukku? Why? How? Emerald Empire and material in other books addresses mundane aspects of a samurai’s existence, but I’m still trying to process how the world works. You aren’t supposed to wear armor anywhere that is supposed to be safe – this often comes up when traveling in adventures. How far out are patrols? What are the areas without patrols like? No peasants? How big are these wilds areas? On a different topic, ashigaru get mentioned often but samurai are often the ones who do stuff in adventures, for obvious metagame reasons. But, what about these ashigaru? How common are they? What are their lives like? What is their military organization like (given that I don’t have virtually any sense what the samurai military organization is like)? How do they work together with samurai? In theory, much of warring is done by ashigaru, but the game acts like it’s Crane duelists taking out Lion commanders while actual lions are running around and dying to Phoenix fireballs as Utaku Battle Maidens charge into dual-wielding Mirumoto. You are currently browsing the ICLee's Gaming Blog blog archives for March, 2012.